In honor of my Lilypad-iversary, I have created a fun flair pack to coordinate with my first ever TLP products - Bloomin' Sweet and In Stitches Alpha, which were released as part of the February 2012 BYOC, as well as my Sweet Talk Papers. These sparkly shaker flair buttons add a fun and festive accent to your pages! Sweet Talk Shaker Flair includes the following 24 designs, each in a blingy shaker box style version and a simpler unembellished version. Flair buttons are 1.5" in diameter. Smaller items shown in preview are at 100% relative to 12x12 canvas. In honor of my Lilypad-iversary, I have created a fun paper pack to coordinate with my first ever TLP products - Bloomin' Sweet and In Stitches Alpha, which were released as part of the February 2012 BYOC. Sweet Talk Papers includes 15 lively patterns and 9 beautifully textured solids. 24 12x12 papers in all. Created with love at 300 ppi. 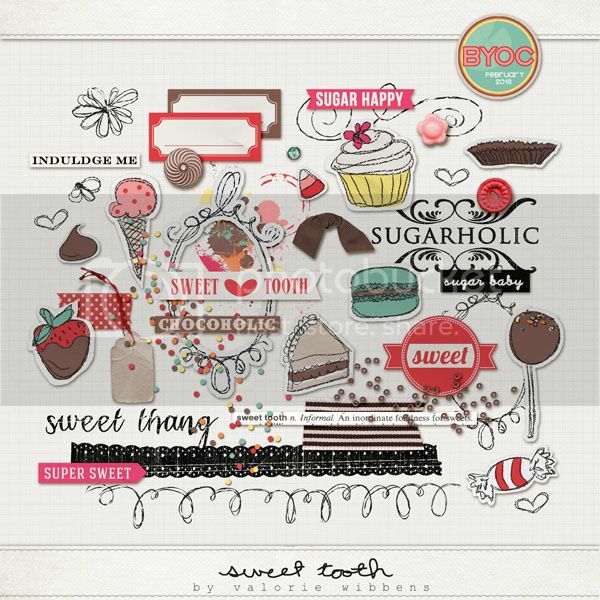 Set of 15 sweet and sugary papers. Cooridnates with Sweet Tooth Elements! Whether we love Valentine's day or dread it, this is the ooey gooey time of year. And one fabulously wonderful byproducts of this holiday time is the opportunity to intentionally focus on those things and the people we love. It's a great time to be deliberate in our counting of blessings and enjoyment of the little moments that make up the mosaic of our lives. And it's that gratefulness for moments, for character, for the little things that make us smile that is at the creative core of this mini-album project. It's all about the letting yourself "count the ways", consider the reasons you love a person, value a relationship or find joy in your day. It's fun and cohesive and it's versatile. It's full of pages of various sizes, in a simple and cohesive style with plenty of white space to drive the eye to what matters most -- the core of your pages in the Reasons album. All with the hope of helping you easily share your heart, document the reasons that make your life full, and celebrate The Why. You could scrap "10 Reasons" you love your spouse or child or you could document what makes you smile, or count the reasons why you love anyTHING or any ONE. The possibilities are endless! This layered template album can be used in whole or in part, for digital or hybrid scrapping of your ooey gooey stories. Includes templates in varied styles and sizes so you can pick your favorite size or mix and match to add interest and dimension and create a mixed media kind of album. Coordinates beautifully with the February BYOC product line here at The Pad. * 11 additional 6x6 simple layered templates (in .psd + .tiff formats). These too can be used alone as a mini album or as a supplement to the larger page sizes. They are foundational and created to help you supplement and build your mini album. * 8 4x6 simple layered templates (in .psd + .tiff formats). These too can be used alone as a mini album or as a supplement to the larger page sizes. They are supplemental though could be used to create fun and separate mini mini album. Every template design is unique while still carrying a cohesive look for an overall album and classic enough to be able to mesh well with any other projects. They are meant to be built upon with your own style and customization and can be used with any products. You can also re-use any of the design pages throughout the album, flipping and modifying to make them your own and to suit your scrapping or album needs and style. You can mix and match the sizes with each other, you can mix and match the background paper pieces, the photo spot design layers, the overlays or trims here and there to make this album completely your own. Or you can use it in a straight-forward way too. Have fun playing with all the components to create what suits your story best! * 5 transparency overlays in various sizes (4 6x6 and 1 4x6) which can be used to overlay papers or photos or printed on transparencies. Patterns are classic and versatile. All the transparency overlays can be used to create actual printed transparencies for hybrid or traditional paper scrapping projects or they can be used digitally in a variety of ways. The pages and transparencies are created with a heart for Documenting your reasons, cataloging character, or taking stock of the little joys. And I so hope you have fun with them! All products are created at 300 DPI for optimal printing quality. These products, and all of my templates, are S4H/S4O friendly. Please see my TOU for full terms. I hope you have fun scrapping your own stories with the Ambrosia collection! Feel free to visit my blog: http://plantyourstory.com/ for more inspiration, story centric journal prompts, updates, goodies and news. Includes 26 doodles in abr and png format and approximately 50 elements all lovey dovey and sweet.... Not all shown. Includes 12 lovely papers three of which have alternate versions just for kicks! Includes 8 styles of page protectors with square designs! ALSO included are THE TEMPLATES to use behind them! Templates come in BOTH straight and rounded corners! Page protectors come as .png files and templates come as .psd files. NOTE: Due to the nature of being digi and the canvas being 12x12, Each page protector is slightly smaller than 12x12, making each section of the protectors slightly smaller. A collection of lovey dovey bits and pieces that are perfect for adding a touch of hand drawn whimsy to your pages and projects! Contains: arrow heart, bookplate, 3 doodle strips, entwined hearts, 4 other hearts, 2 'love' wordart pieces, book corner, row of hearts and cluster of tiny hearts. I love, love, LOVE art journaling, and I so often find that my half finished expressions make wonderful textured photo mats, story bits, or mini book pages. Enjoy the messy and artful textures, and find these bits to be a great start for your own stories of Love and care, or simply a cool home for your photos. Named for my little girl, Tiara Joy, who made me this awesome artfully painted paper and asked me to turn it into something that could go into my store! The letters are curved to echo the happy fun of childhood, with plenty of hearts for all of those we love to be with. The best part is, my little Tia couldn't be prouder of her collaboration. I LOVE spray paint and spray ink for their unpredictable and imperfect nature, the blots, drips, and smooshes make every design unique! So, of course I a little extra Lovin' in my graffiti spray series!...you get all of the carefree design fun without ANY of the overspray mess. a set of papers that coordinate with the 2012 February BYOC. Love. The fairest and most celebrated of all emotions. So many kinds and so many stories to tell- love between mother and child, husband and wife, sister and brother, best friends, old friends. Get those precious memories onto a layout with this gorgeous element pack, Key to My Heart. Created in a beautifully warm & soft, non-traditional color palette, this peach and teal kit pack has a variety of vintage and retro pieces designed for easy layering and clustering. Perfect for clean and simple designs, or for heavily detailed works of art! Perfectly coordinates with February 2012's BYOC. Love. The fairest and most celebrated of all emotions. So many kinds and so many stories to tell- love between mother and child, husband and wife, sister and brother, best friends, old friends. Get those precious memories onto a layout with this gorgeous Key to My Heart paper pack. Created in a beautifully warm & soft, non-traditional color palette, this pack has a variety of vintage and retro patterns, ranging from feminine florals to sturdy kraft backgrounds. Use them to scrap your love related stories, or combine them with other element packs for an endless amount of non-themed pages! Pack includes 9 unique papers. Washi Tape Strips No. 2 and Key to My Heart Element Pack.